A variety of floor coverings are used in Indian homes. The simple durree is used for making beds. Larger durrees are used on festive occasions over which pile carpets and other embroidered items are spread for the guests. Long strips of durrees are prepared specially for serving food for the guests during festivals and marriages. The durree is a cotton -woven thick fabric meant for spreading on the floor and it is an indigenous floor covering with a variety of designs and patterns. Weaving of a durree is a common sight in almost all of the Indian villages. In the states of Punjab and Haryana, the Jat women weave durrees for thei personal use. Jaisalmer and Barmer in Rajasthan produce woolen durries. Uttar Pradesh is an important center for the commercial weaving of these durrees. The durrees produced here have geometrical patterns woven in strips, diamonds and lozenges. The other centers, which are weaving durrees, are Navalgund in Karnataka and Salem in Tamilnadu. The Navalgund durrees are also known as Jamkhans. They are richly patterned and depict stylized parrots and peacocks. Normally rust, yellow, green and black colors are used. The Salem durrees come from a town called Bhavani and they are woven in silk and cotton. 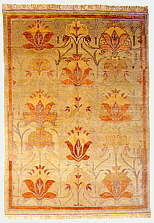 They are prepared in brilliant colors with a central pattern of lotus and borders with flowing floral patterns. Warangal near Hyderabad also produces durrees. The Bandha or Ikat durrees are being woven here. Indian Carpets Pile carpets were probably introduced into India from Iran. During the Mughal period, this craft flourished in Agra, Delhi and Lahore. 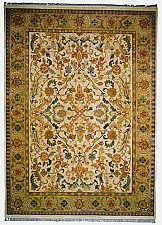 Kashmir developed this carpet industry in the 15th century during the reign of Zain-ul-Abidin. Here the carpet making closely follows the shawl- weaving tradition. It is specialized in designs based on Persian and Central Asian styles. The important centers of carpet weaving in India are Srinagar in Kashmir, Jaipur in Rajasthan, and Amritsar in Punjab, Mirzapur, Agra in Uttar Pradesh and Warangal and Elluru in Andhra Pradesh. Amritsar came into the scene only in the beginning of the 19th century. 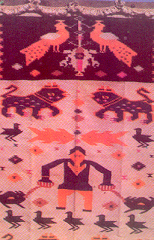 It has a tradition of weaving fine quality rugs and particular designs called Mouri. The designs are geometrical patterns. They mostly export their products. Embossed carpets based on Chinese designs are reproduced here. Carpets produced in Agra are of the finer quality patterns in red, ivory, green and black background. Fine quality carpets are also produced in Amritsar. Jaipur in Rajasthan produces medium quality carpets, which vary from 80 knots to 120 knots per square inch. Most of them are of the geometrical pattern. Mirzapur and Bhadoli also make medium quality carpet varieties. Andhra produces geometrical- patterned carpets of medium quality of around 30 to 60 knots per inch. They are mostly meant for export orders. Kashmir is also known for other types of floor coverings apart form the carpets they are well known for. Those are the Namdas, Hook rugs and gabbas. Namdas are made of felted wool and cotton and are embroidered with woolen chain stitches. The hook rug is made with chain stitch embroidery worked with a hook called ahri. A thick jute cloth is used and then it is embroidered fully so that the base material is not visible. The Gabba is a kind of an applique work done with worn out woolen blankets and Pattis.